Find artworks, auction results, sale prices and pictures of Giovan Battista Ruoppolo at auctions worldwide. 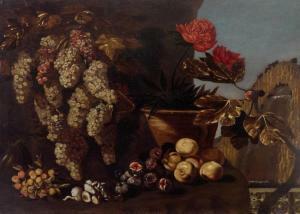 RUOPPOLO, GIOVANNI BATTISTA (ATTRIBUTED) (1629 Naples 1693) Still life with grapes, figs and mushrooms in a landscape. Oil on canvas. 100.5 x 122 cm. Expertise: Prof. Alberto Cottino, 10.5.2011. Provenance: - Ray Ketcham Gallery, Atlanta GA (label on the reverse). - European private collection Exhibited: Il Ritratto della Natura, Dal Seicento alla Fotografia contemporanea, Caraglio 2013. --------------- RUOPPOLO, GIOVANNI BATTISTA (ZUGESCHRIEBEN) (1629 Neapel 1693) Stillleben mit Trauben, Feigen und Pilze in einer Landschaft. Öl auf Leinwand. 100,5 x 122 cm. Gutachten: Prof. Alberto Cottino, 10.5.2011. Provenienz: - Ray Ketcham Gallery, Atlanta GA (verso Etikette). - Europäische Privatsammlung. Ausstellung: Il Ritratto della Natura, Dal Seicento alla Fotografia contemporanea, Caraglio 2013.
on the reverse inscription on an old label:"J.D. 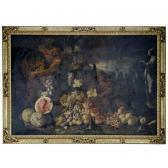 de Heem"
29 1/2 by 40 1/4 in. ; 75 by 102 cm. Ferdinand I, King of the Two Sicilies;By whom given to an ancestor of the anonymous consignor inSale ('Collection T.L. 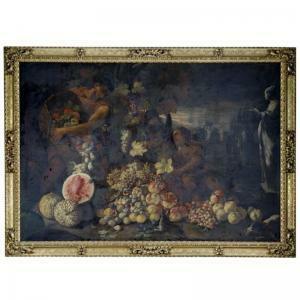 '), Monaco, Sotheby's, 21 June 1991, lot 114(a pair of paintings);There purchased by the present collector. 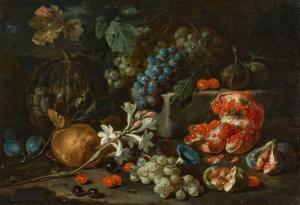 At the time of the 1991 sale in Monaco (see Provenance), thispainting was sold with its pendant, Still Life in a Landscape withOranges, Lemons and a Parrot. The pendant painting, which is signedat lower left G. Ruoppoli, was subsequently sold in these rooms on24 January 2002, lot 24. According to the catalogue entry of the1991 auction, both pictures were at one time in the royalcollection of Ferdinand I, King of the Two Sicilies (1751-1825) inthe 18th century and were given by him to an ancestor ofthe consignor in that sale. 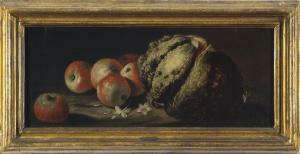 Writing in the mid-18th century, the art historianand biographer Bernardo de' Dominici described Giovanni BattistaRuoppolo as one of the great still life painters in Naples andwrote a detailed notizia on his life.1 His works wereavidly collected by the aristocracy and wealthy citizens of thatcity. Several works by Ruoppolo were recorded in the collection ofFerdinand van den Einden, the famous Flemish banker and art patronwho lived in Naples.2 Ruoppolo's style shows his awareness of artists from his own andearlier generations. His youthful works reflect the naturalism ofother Neapolitans such as Luca Forte and Giovan Battista Recco, aswell as his knowledge of the Roman still life tradition harkingback to Caravaggio. His mature works became more elaborate anddecorative, possibly due to the influence of Abraham Brueghel whocame to Naples in 1675. 1. B. de' Dominici, Vite dei Pittori, Scultori ed ArchitettiNapoletani, Vol. III, Naples 1742-45, pp. 292-295.2. See R.Middione, in C. Whitfield and J. Martineau, eds., Paintingin Naples 1606-1705 from Caravaggio to Giordano, exhibitioncatalogue, London 1982, pp. 240-41. Possibly in the collection of Don Miguel Martinez de Pinillos y Saenz de Velasco during the early 19th century, but probably acquired by his son Don Antonio Martinez de Pinillos (1865 - 1923), Cadiz; By direct descent to his daughter Doña Carmen Martinez de Pinillos, Cadiz; Thence by family descent to the present owners. The present and following lot, along with lots 233-242 from the day sale on 6th July, come from the collection of the Martinez de Pinillos family, landed in Cadiz since the late 18th century. Of aristocratic origins, the family descend from the Counts of Villanueva. They were attracted to Cadiz by the wealth in maritime trade and in 1835 founded the Pinillos family shipping company, today one of the oldest in Spain. The company founder was Don Miguel Martinez de Pinillos y Saenz de Velasco, who became an avid collector as well as philanthropist. Under the auspices of his son Don Antonio de Pinillos (1865-1923) the family business prospered further and he added significantly to the family collection, facilitated by the access to foreign artwork through the international network of shipping routes. Particularly important in this respect were the busy ports of Naples and Genoa, the work of whose local artists feature strongly overall in the collection. The present works are offered by the heirs of the late Exma. Dona Carmen Martinez de Pinillos (Gran Cruz de Merito Naval), who was daughter to the principal family collector, Don Antonio. This impressive scene is a collaborative work between one of the leading Neapolitan still-life painters, Giovanni Battista Ruoppolo, and the figure-painter Paolo de Matteis, who was a pupil to Luca Giordano. 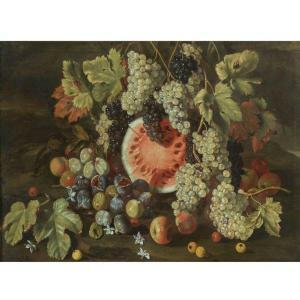 The painting can be closely compared to another still life by both artists, offered in London, Christie\\’s, 9 July 1993, lot 85, which shares the present painting's large-scale format (244 by 348 cm.) and compositional type, with an extensive still life in a landscape setting, interspersed with figures. Giovanni Battista Ruoppolo was a direct contemporary to Giuseppe Recco in Naples and specialized in large-scale still lifes painted to decorate the interiors of the palazzi and grand residences of his wealthy patrons. Many such works found their way to Spain during the 17th and 18th centuries, where the demand for Neapolitan painting was extremely high amongst the Spanish aristocracy and ruling classes. The figures in the present work are by Paolo de Matteis, who became a protégé of the 7th Marqués del Carpio, Gaspar de Haro y Guzmán, who served as Spanish Ambassador in Rome until 1683, whereupon he was appointed Viceroy of Naples, taking Paolo de Matteis with him as part of his entourage. It seems likely that the present work dates from the latter half of the 1680s, after De Matteis' return to Naples in 1683 and before Ruoppolo's death a decade later (in 1693).